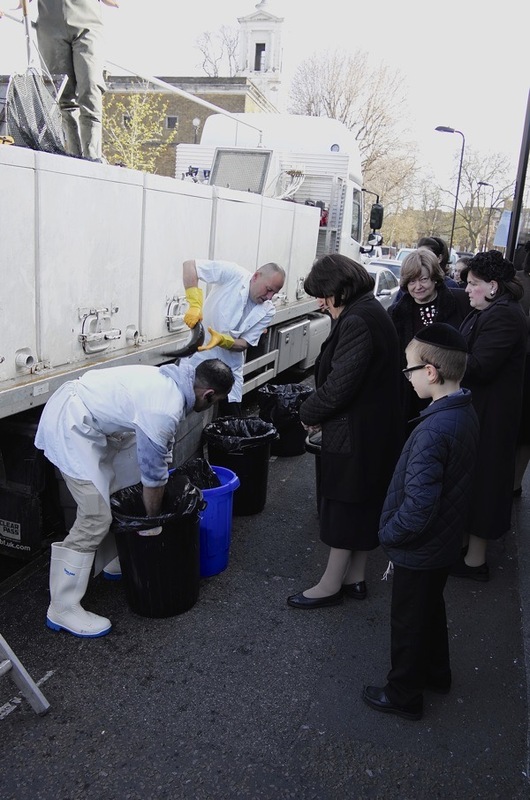 At nine o’clock yesterday morning, a tanker of fish pulled up at the kerb outside Hoffman’s Fish Shop in Stamford Hill, where a small crowd of families had already gathered in keen expectation of its arrival. 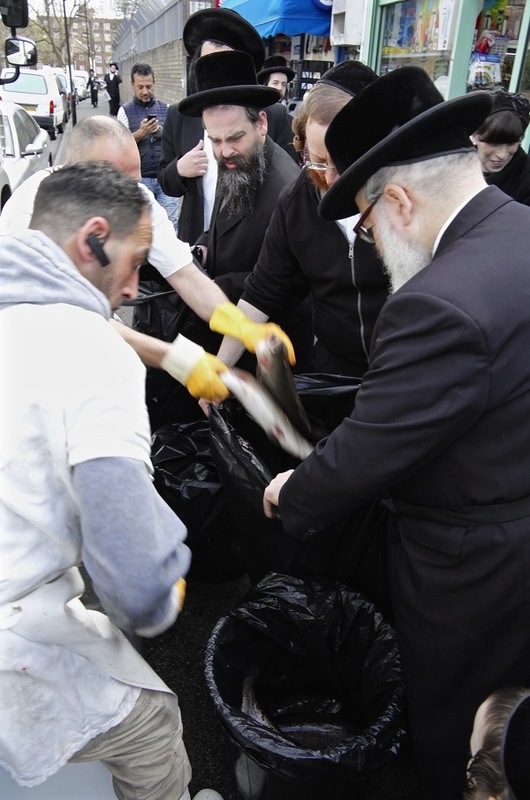 They were seeking live salmon and trout to cook for Passover. 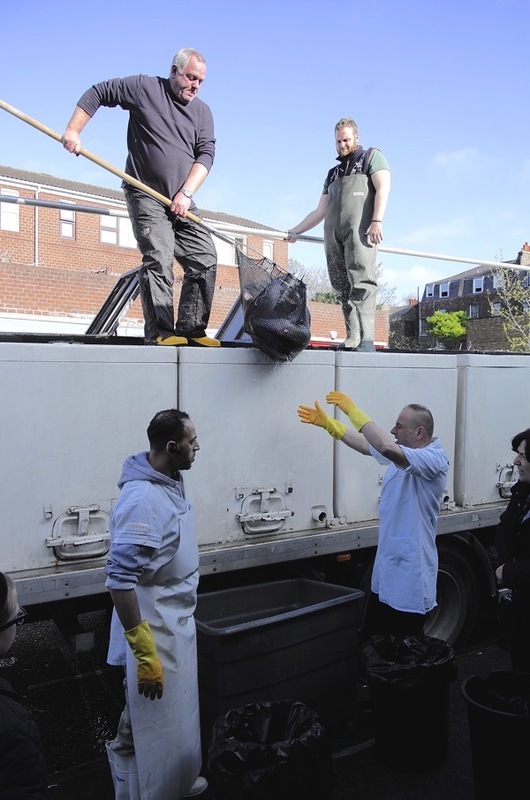 Each customer had a plastic bin lined with a black bag and they stepped forward in turn to select live fish decanted in nets from the truck into tanks on the pavement. 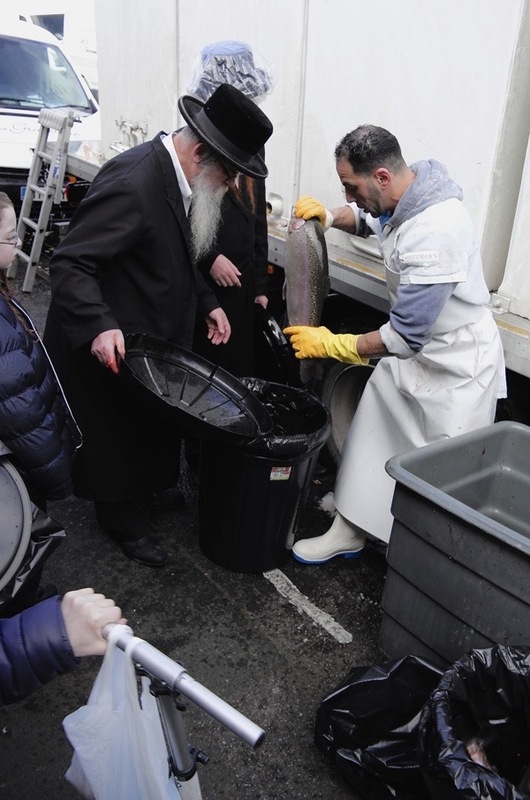 The nature of the season, the splashing of the water and the liveliness of the fish engendered an infectious excitement as occasionally a large salmon made a leap for freedom onto the pavement, engendering shrieks of delight from the younger members of the congregation. 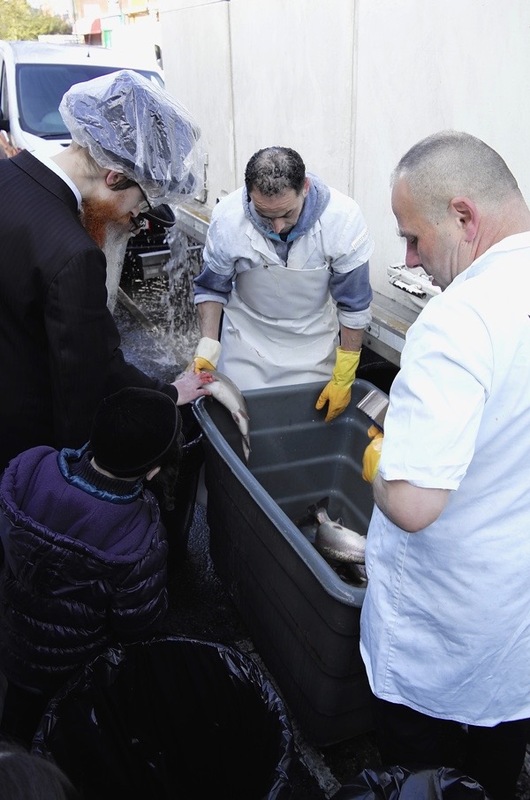 Yet before long, everyone had acquired the requisite number of salmon and trout necessary to feed their family and relatives, and set off for home with their bags of fish still twitching in anticipation of Passover. Thank you for this. 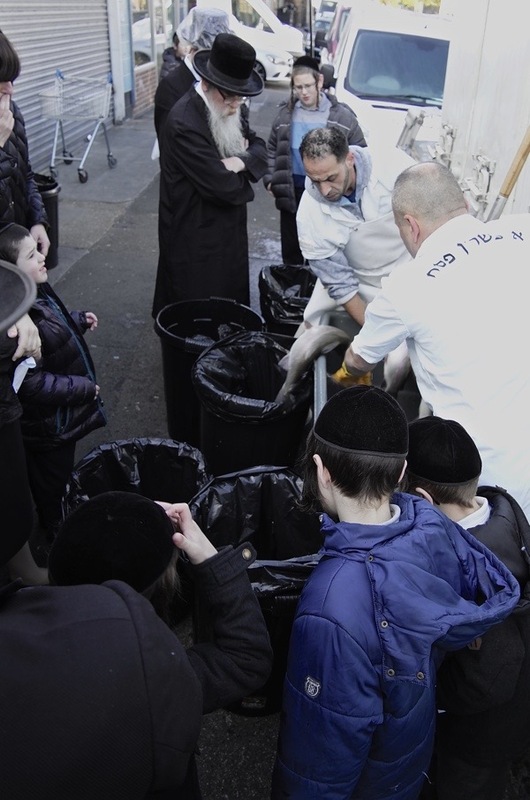 As a non-Jewish descendant of a very large family I am still learning about traditions and celebrations. 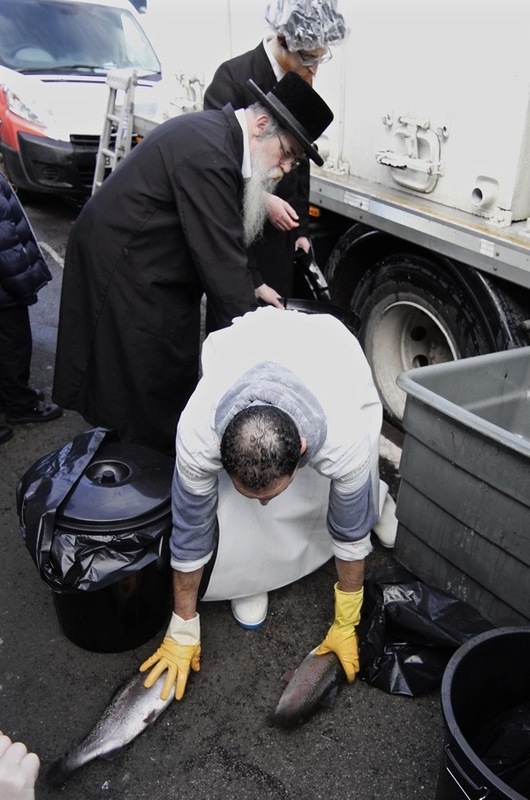 To be told about PAssover is one thing, to be shown the traditions leading up to it is so enlightening. Thank you. I have been reading and following your blog for a couple of years now and I have learned a lot about where my ancestors came from. Thank you for these very different insights into your corner of London. Great post and great pix as usual! 1. 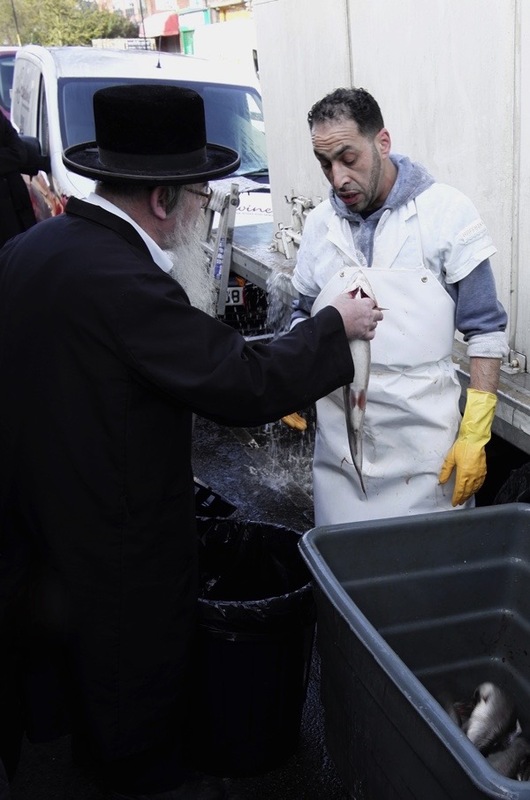 If the fish are salmon and trout, probably for salmon and trout, not gefilte fish! 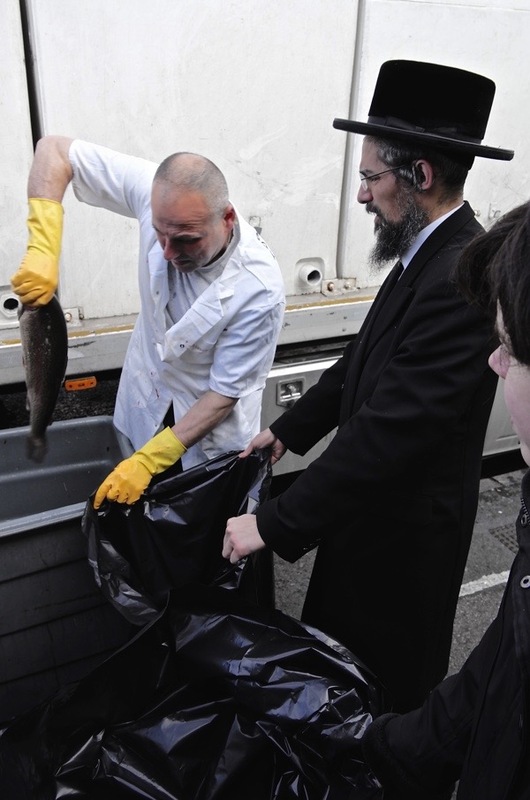 ‘Gefilte fish’ – boiled or fried fish cakes – is usually made from white fish, especially carp, pike, and – in N America – whitefish itself. Ground fish… eggs … onions etc – poached and served as an appetizer. (Many local variants!). 2. Why live fish? 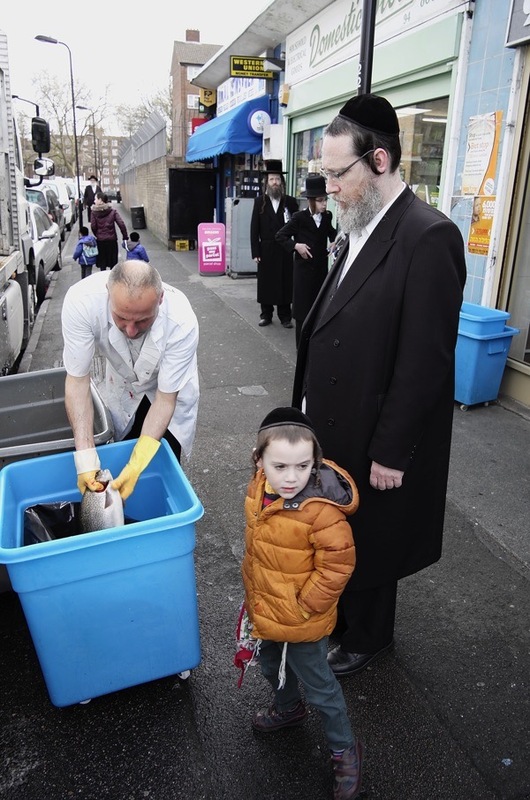 Because the Hasidic groups (pictured, and constituting the main Stamford Hill Jewish community) like to ensure that the fish (and chicken) they eat over the Passover holiday (begins next Monday evening) are fed bread-free / leavened wheat-free diets for a week or so before the holiday. The poultry farmers and butchers who supply this community take care of it. The fish … more difficult! 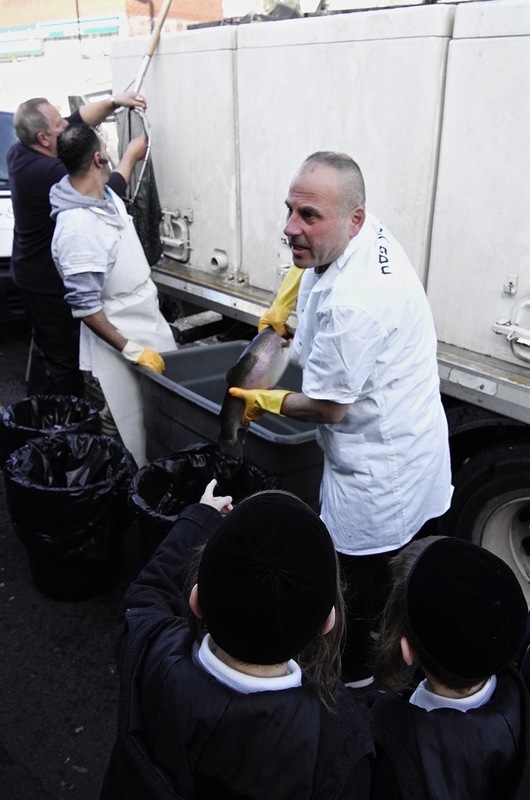 Hence their practice of buying live fish a week or so before the holiday, keeping them in tanks (or a spare bath…) and feeding them in the requisite manner before dispatching, gutting and cooking! Whatever holiday you are celebrating at this time – or none – happiness and peace to all Spitalfields blog readers! I was just introduced to your website this evening and cannot tell you how much I am enjoying reading the articles and viewing the superb photographs here. 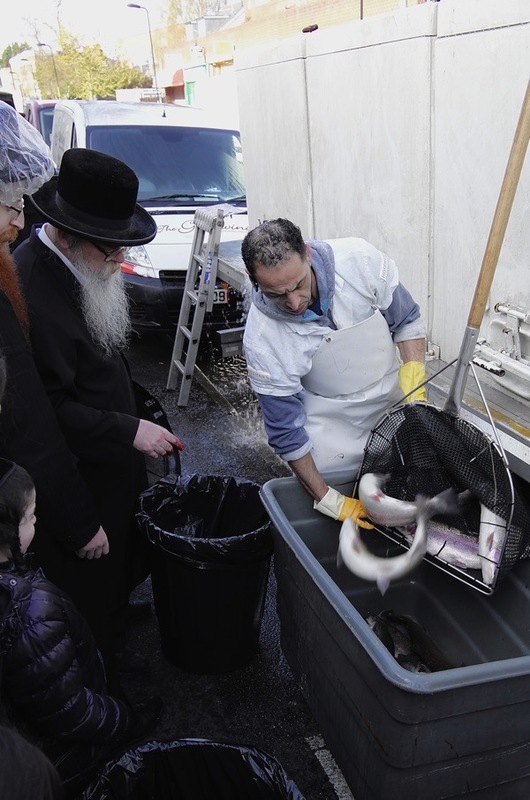 As Passover is nearly upon us this article brought back fond memories of my mother and father going to the “fish shop” to buy the required species for the gefilte fish my father made by hand at Passover. I am from Chicago, Illinois in the US, so the fish used were freshwater types, such as whitefish, carp, and buffalo fish (considered a “trash fish” by fishermen). 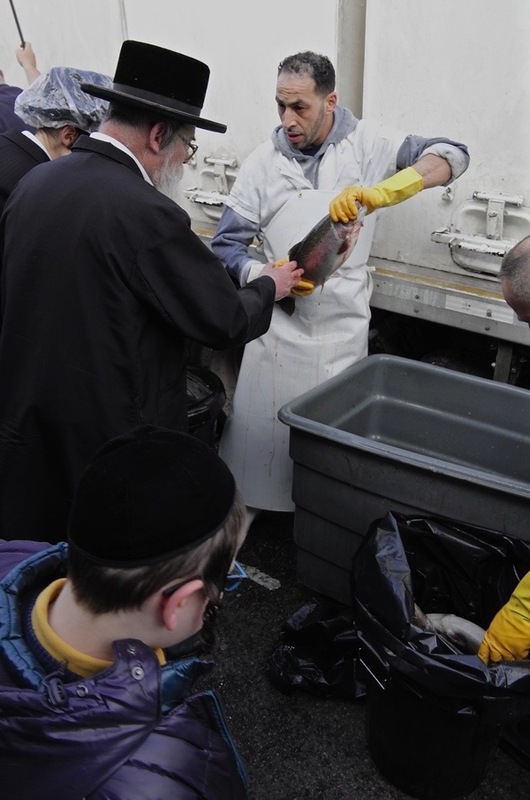 I now live on the West coast near San Francisco and if I decided to make gefilte fish from scratch I’d be using salmon and other saltwater species just as the people in this article did. Thank you once again for your wonderful articles!